Near mint. Woven brown letters on a rayon base.85x65 mm. Nära perfekt. Vävda bruna bokstäver på en vit rayon bas. The structure of the NSV was based on the Nazi Party model, with local, county (Kreis) and group administrations. Erich Hilgenfeldt, who worked as office head at the NSV, organized a charity drive to celebrate Hitler's Birthday on April 20, 1931. Following this move Joseph Goebbels named him the leader of the NSV. The NSV became established as the single Nazi Party welfare organ in May 1933. On 21 September in the same year Hilgenfeldt was appointed as Reich Commissioner for the Winterhilfswerk (Winter Support Programme). Under Hilgenfeldt the programme was massively expanded, so that the régime deemed it worthy to be called the "greatest social institution in the world." One method of expansion was to absorb, or in NSDAP parlance coordinate, already existing but non-Nazi charity organizations. 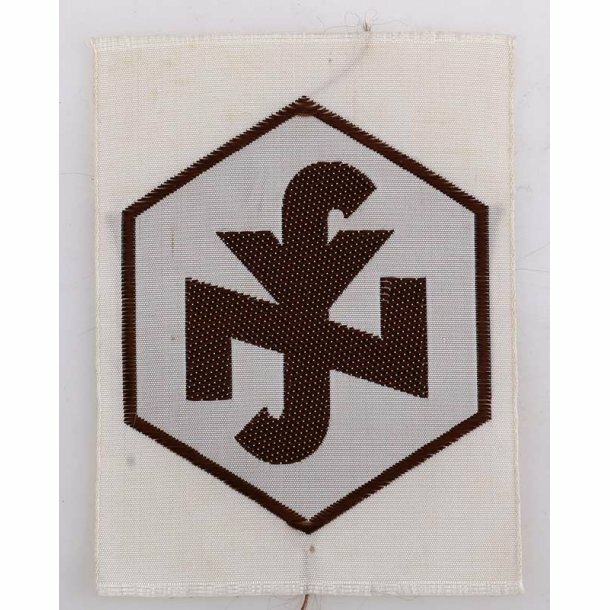 NSV was the second largest Nazi group organization by 1939, second only to the German Labor Front. During World War II, the NSV took over more and more governmental responsibilities, especially in the fields of child and youth labor. NSV was often discriminating against Jews since they didn't belong to the German 'People's community', and refused to provide aid to them. After Nazi Germany's defeat in World War II, the American Military Government issued a special law outlawing the Nazi party and all of its branches. Known as "Law number five", this Denazification decree disbanded the NSV, like all organizations linked to the Nazi Party. The social welfare organizations had to be established anew during the postwar reconstruction of both West and East Germany.